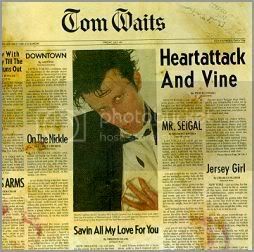 Why: If the only prior exposure you had was Closing Time, your first thought upon hearing Heartattack and Vine would be "Who is this singer and what has he done with Tom Waits?" That might be a stretch, but there is a marked difference between the soothing, gravelly crooner from Closing Time and the fiery Revivalist bluesman we hear on HAV. In fact, you'd have to go back to Waits' third album, the live-in-the-studio Nighthawks at the Diner, to find Waits first assuming a more gruff, uninhibited vocal approach. Nighthawks isn't remembered Waits strongest batch of songs, but it introduced the world to Waits' sly stage charm and quick wit. And of course, it features "Big Joe and Phantom 309", a stirring performance I'll always equate with one rainy drive. At any rate, we'd never really hear the Closing Time/Saturday Night Waits again (unless you count his film score One From the Heart). 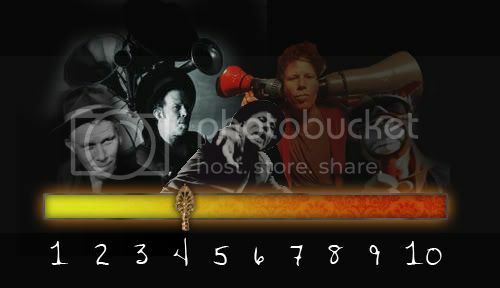 The next five albums were populated by noir-ballads and spoken-word sagas. Still, they each have a unique feel, as Waits isn't one to rest on his laurels. Heartattack and Vine is unagitated, but clearly up to something. It just feels like a smokey dive bar: the shifty-eyed blues numbers wandering around, shooting pool and taking drags; the weepy ballads perched on stools, waxing nostalgic over cheap beer. Songs: As I mentioned, you'll basically find two breeds of song on Heartattack: Brawlers and bawlers (to keep with the Tom Waits vernacular). The brawlers are sneering, sweaty, and gnarly, including the title track that boasts one of Waits best one-liners: "There ain't no devil, there's just God when he's drunk". "Mr. Siegal" is a rabble-rousing blues stomp that finds Waits further exploring devilish lyricism and a ravaged vocal style. But the bawlers cemented the album's classic status, thanks in part to The Boss. Bruce Springsteen famously covered "Jersey Girl", and it's become a fan favorite--and probably thought to be a Springsteen original by many. "On the Nickel" embodies early Waits in so many ways: The simple piano/string approach, the Newman-esque delivery, the hobocentric lyrics. It's the only pre-80s song Tom played when I saw him, which tells you something about his regard for the tune. As eye-misting as "On the Nickel" may be, it seems like "Walking on Sunshine" compared to "Ruby's Arms". The album-closer has got to be one of the saddest songs ever put to tape. The opening horns, the sweeping strings,the piano progression, Tom's desperate delivery, those somber lyrics: Just twists my chest every time. It's the kind of song that Tom's rugged voice suits so well; you believe that he's the character who's wandering out into a freight yard, leaving his sleeping lover in the first light of morning. 4: With Heartattack and Vine, Tom is still holding a lot back. His jazzbo persona is starting to split at the seams--soon it will burst, and leave a shadow-dwelling carnival barker in its stead--but for now, he's still confined to a vaguely recognizable archetype. Still, the ramped-up vocal attack might frighten the uncautioned ear. Also Check Out: The aforementioned Small Change is, in the grand scheme of Waits' catalog, a more important album to know. But don't overlook Blue Valentine, which is climbing my list of early-Waits favorites every time I hear it. Up next, Tom loses the jazzbo shtick and moves on to the most risky (and successful) period of his career.